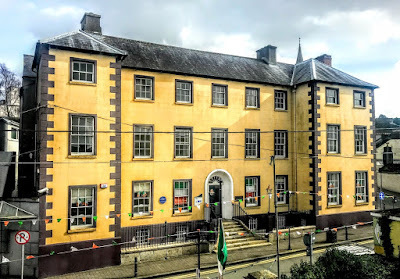 Delare House on South Street, New Ross, stands across the street from Saint Michael’s Theatre, once Saint Michael’s Chapel, which served as the parish church of this Co Wexford town from 1806 to 1902. Charles Tottenham (1716-1795) of Mac Murragh House built Delare House in 1790 as his townhouse in New Ross. Mac Murragh House, the Tottenham country house immediately north-east of New Ross, was demolished in 1946, so Delare House represents an important surviving link in the town with the Tottenham family. This Charles Tottenham was a grandson of Charles Tottenham (1685-1758), known as ‘Tottenham in his Boots.’ The younger Charles Tottenham sat in the Irish House of Commons for 40 years from 1755 to 1795 as MP for Fethard (1755-1760), New Ross (1761-1768), Bannow (1768-1776), Clonmines (1776-1790) and Fethard (1790-1795), all in Co Wexford. 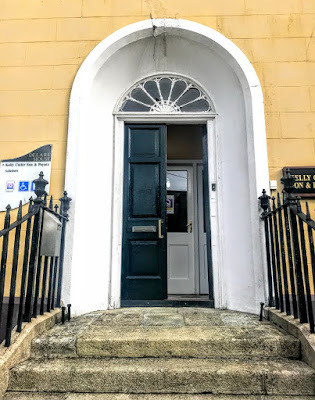 When Charles Tottenham died in 1795, Delare House was inherited by his son, also Charles Tottenham (1743-1823), who was the pre-Union MP for New Ross in 1768-1800. The Tottenham family papers show that Charles Tottenham expressed his disapproval when the site for Saint Michael’s Chapel across the street was provided by his brother Nicholas Loftus Tottenham (1745-1823), MP successively for Bannow and Clonmines, Co Wexford. Delare House is an important part of the 18th-century domestic built heritage of New Ross. Its interesting architectural include its almost-symmetrical shape centred on a ‘Morrison Doorcase’ that has a simplified ‘peacock tail’ fanlight. The windows diminish in scale on each floor, producing a graduated visual impression. Other architectural features include the rendered chimney stacks with rendered capping, the flight of eight cut-granite steps with cast-iron boot-scrapers, the bas-relief door surround with concave reveals that frame timber panelled double doors, and timber sash windows. Although I did not get inside Delare House last week, I understand the interior includes a central hall that still has its original encaustic tiled floor, the original staircase on a dog leg plan, timber panelled doors with carved timber surrounds, and decorative plasterwork from the cornices to the ceilings, as well as an inlaid cut-veined grey marble Classical-style chimneypieces. In the past, South Street has also been known as Michael Street and as Chapel Street. 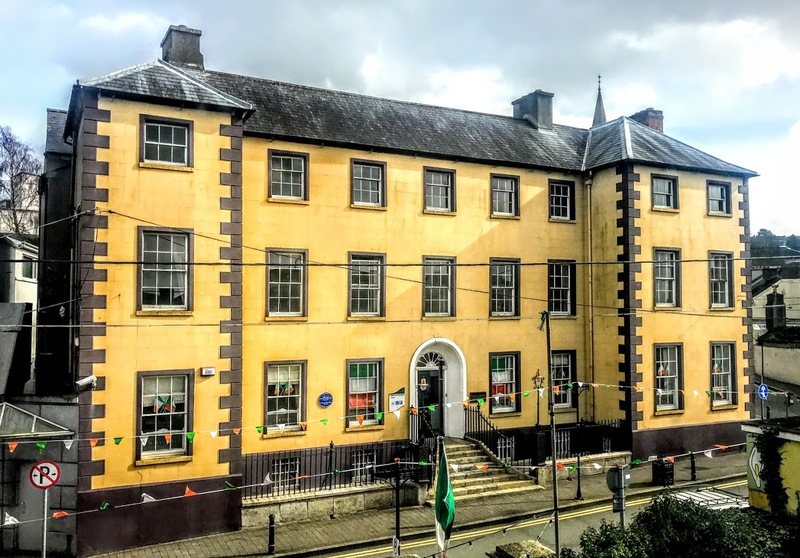 The Sisters of Mercy, founded by Mother Catherine McAuley, moved to New Ross is 1853, and at first lived in a house in Priory Street. The Carmelite nuns and the Christians Brothers were already in the town since 1817 and 1849 respectively, and the Sisters of Mercy were followed by the Good Shepherd nuns (1860), the Sisters of Saint John of God (1873). 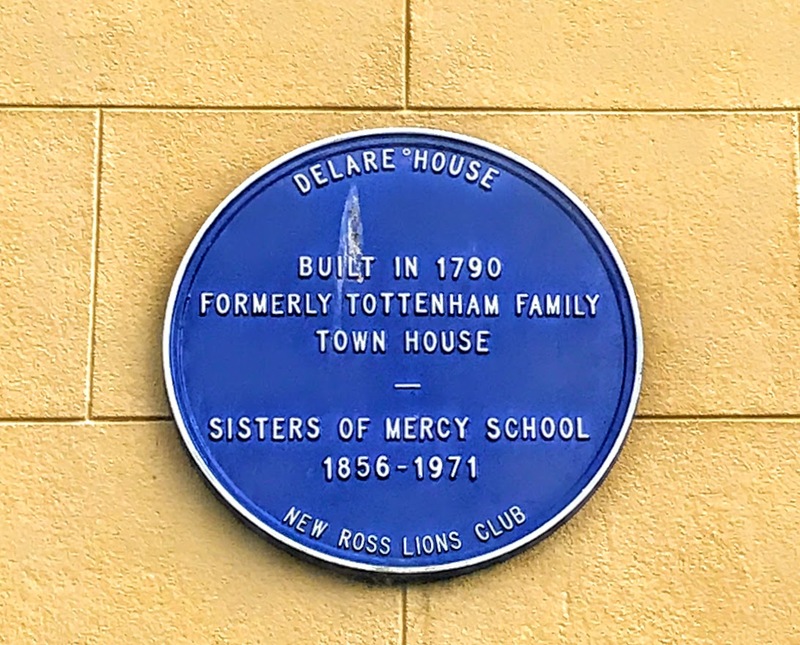 The Tottenham family gave Delare House on a long lease and at a moderate rent to the Sisters of Mercy in 1854. 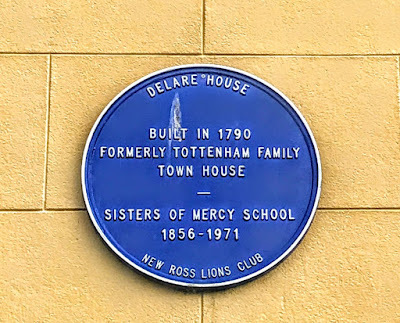 Delare House was adapted for use as a convent by 1856, and the Sisters of Mercy opened their school. The Senior Department began in 1856 as a private day secondary school teaching English, arithmetic, needlework, knitting, lace-making, deportment, elocution and religion. It was known as Saint Mary’s, an ‘Academy for Young Ladies,’ and had about six or seven pupils in each class. New school buildings were designed in 1894-1895, the architect of the Church of Saint Mary and Saint Michael, the new Roman Catholic parish then being built in New Ross. It became a secondary school in 1917, and a boarding school opened in 1926 to complement the day school. The school moved to Irishtown in 1969, and the Convent of Mercy on South Street closed in 1971. Delare House was restored in 2003-2004, and it is now used as office accommodation. Delare House has been well maintained for more than two centuries, the elementary form and massing survive intact together with substantial quantities of the original fabric.